UPDATE: The festival has come and gone and guess what, it was super awesome! Gig Harbor is home to a pretty great little web of breweries that you can easily access by bike; once you get there, that is. I came from West Seattle via the Southworth Ferry. My route took me through Olalla, which I discovered is rather hilly. Not only that, the hills are well known throughout the area, as the impressed people of Gig Harbor confirmed upon seeing me in my bike attire. Don't let that stop you though, it is several miles of hospitable rural forest land with very few cars and wide shoulders. If you want to really earn those beers, this is a great way to do it. Once at the Gig Harbor Beer fest, I was astounded to find a total lack of Seattle freeze. This well documented Seattle phenomenon which plagues transplants to the city describes how locals (and really all people who’ve been here for a while) just don’t quite know how to talk to strangers, and prefer the head down, look away approach to meeting new people. This doesn't seem to be the case in Gig Harbor, where jovial revelers gladly strike up a conversation with anyone standing in a group of 2 or less for longer than exactly 10 seconds in much the way you might have back in your early twenties and even then only at your very drunkest. City of Gig Harbor: well done. You and your tiny community of boat people have me sold. I’m making my mom move there so I can come back before the next Gig Harbor Beer Festival. Shout out to Frank, the guy who makes all the personalized beer shirts everyone was wearing like the one on Howard below. I NEED ONE. I looped around the festival hunting down the breweries that call Gig Harbor home. Gig Harbor has to share many of its breweries with nearby Tacoma: Gig Harbor Brewing Co, 7 Seas, Harmon, and Fox Island all exist in Gig Harbor as taprooms, with their main breweries being located elsewhere, but that’s ok! Gig Harbor is a small place, so what can you expect? Tacoma has a surprisingly lively beer scene that I have explored only minimally, and it doesn’t surprise me that they would be the beer Sol to the nearby orbiting beer planets. The best beer of the day award probably went to E2W Shogun IPA because that’s what I voted for. Oh? What’s that? A cursory search of the event on Facebook shows that Ghost Fish won with their Salty Starfish Coconut Brown Ale? Hey, I know those guys! Congrats Ghost Fish. To get back from Gig Harbor was a whole new treat. Rather than just coming back the way I came, I decided to head to Vashon Island, ride across the island, then take the ferry from there back to West Seattle. To do this, I rode across the Tacoma Narrows bridge which was amazing. It has a wide bike lane and even in the out-of-nowhere overcast weather, it was beautiful. My riding partner was concerned that the octopuses that live in the rubble of the old bridge beneath it were going to come up to get her. I was reluctant to agree. The hills never really quit, though unlike in Seattle where traffic, red lights, and possum-like pedestrians exist at every intersection, I found that the vast majority of hill climbs were rewarded with long, uninterrupted descents. A rare and welcome gift. The ride through Vashon was no joke. There is a reason it is home to the sadistic “Passport to Pain” hill climb rides. Despite this, we were able to find a relatively tame route through the place. With all the cideries and the brewery we found, Vashon is a post for another day. 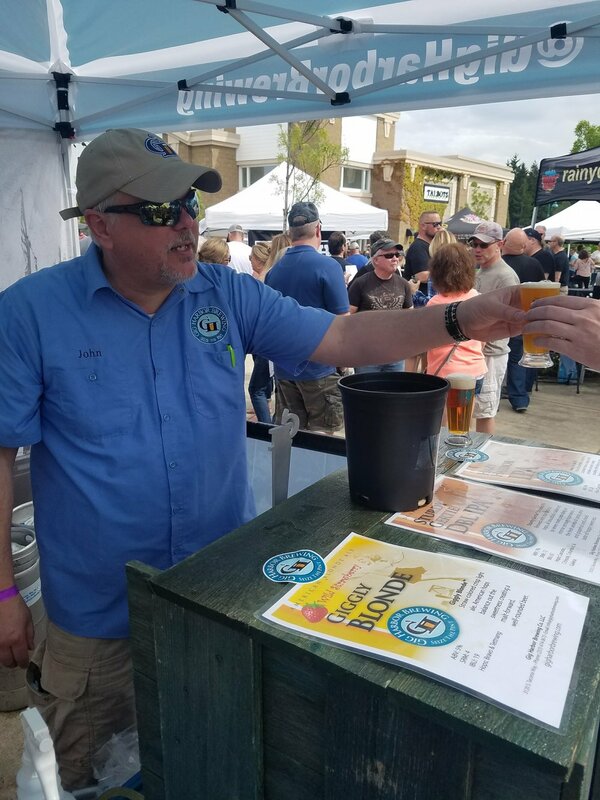 Gig Harbor Brew fest may be a long way to travel for a Seattlite, but getting there is an adventure and well worth the ride. We did the 70-mile loop from Fremont and back in 2 days, stopping near the end on Vashon to enjoy our time, but this ride is a totally doable single day ride for anyone with a little heft to their quads. I know for sure I’ll be back again next year to visit the festival when it rolls around again!